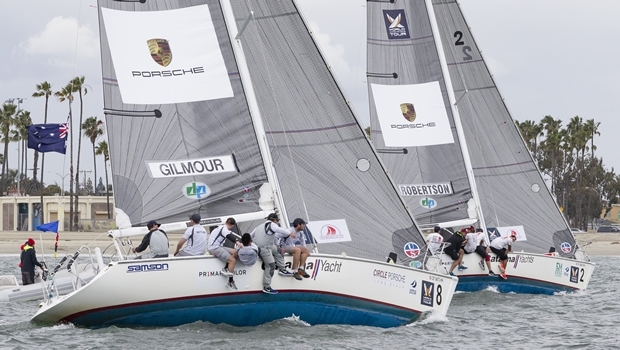 Scott Dickson beat the odds and booked his place in the Semi Finals of the Congressional Cup, Stage Two of the World Match Racing Tour, by knocking out on-form Kiwi Chris Steele (NZL) in a thrilling five match Quarter Final, taking the last three races back to back. Congressional Cup defending champion Taylor Canfield (ISV) US One, dispatched Eric Monnin (SUI) Albert Riele Swiss Team, and Nicolai Sehested (DEN) Trefor Match Racing, eliminated Bjorn Hansen (SWE) Nautiska Racing one-two-three, in the early matches of the Quarter Finals here today. But it was a different story for Phil Robertson (NZL) WAKA Racing, who was placed number one, at the end of Qualifying yesterday. Robertson elected to race Sam Gilmour (AUS) Neptune Racing, – a pairing that presented stunning starts and finishes to the crowds lining the Belmont Veterans Memorial Pier. Robertson won the first match, but Gilmour returned with two wins, before Robertson triumphed in the fourth. It was a similar duel between ‘frenemies’ Steele and Scott Dickson (USA) Dickson Racing. Steele won the first two matches, but Dickson – who earned his way into the Ficker Cup Presented by Porsche qualifier as Long Beach Yacht Club rep, then advanced to Congressional Cup – evened the score, as the home crowd roared. There was an early penalty on Dickson in the pre-start, but Steele was OCS at the start. Dickson went left, Steele right: a risky move in the shifty breeze, and by the top mark, Dickson’s lead opened up to a 30 second advantage. The rest was history, as Dickson did his penalty turn and crossed the line half a boat length ahead of Steele. The first matches of the Semi Finals commenced, but were quickly abandoned as the wind dropped off. PRO Randy Smith announced an earlier start to tomorrow’s final day of Congressional Cup racing: 1100 PDT Sunday April 10.